We love coffee! There is not doubt about it 85% of the Americans consume coffee on a daily basis and it's not much different for the rest of the West (Mitchell. 2013). Caffeine is the #1 drug worldwide (Weinberg. 2001; Mitchell. 2013). In the US people with a death wish select the coffee from the eponymous brand which contains more than twice the amount Starbucks coffee does - and that in spite of the fact that Starbucks is the not so close follow up on place in a ranking with the telling title "Amount of caffeine in coffee in the United States in 2013, by brand (in mg per floz)" (Thrillist | Statista.com. 2014). With 54.2 mg of caffeine per floz and thus ~ 400mg per cup "having a Deathwish" would bring an average male athlete with a body weight of 80kg right to the 5mg/kg body weight maximum that has been used in the majority of high(er) dose caffeine supplementation trials. I've explained in previous articles, already, that for caffeine, more is not always better! In fact, consuming more than 600mg of caffeine pre-workout has been shown to induce a significant reduction in post-workout testosterone and that in the absence of ergogenic benefits (learn more)... certainly not what you're looking for, when you drink one, two or three espressos before your workouts. A possible reduction in testosterone is yet not the only downside you have to consider. A recent study from the University of Sydney, which is the first new study in today's "Caffeine Update", for example, found that the ergogenic benefit of consuming caffeine containing carbohydrate beverages (aka energy drink) during your workouts comes at a price: deleterious effects on sleep (Miller. 2014). As you can see in Figure 1, the caffeine levels, which were zero at the beginning of the trial did not return to baseline in the ~6h before the subjects went to bed. No wonder that the polysomnographic (PSG) recordings show significant changes in disruption of a number of sleep indices including increased sleep onset latency (caffeine 51.1 ± 34.7; placebo; 10.2 ± 4.2 min; p = 0.028) and decreased sleep efficiency (caffeine 76.1 ± 19.6; placebo 91.5 ± 4.2 %; p = 0.028), rapid eye movement sleep (caffeine 62.1 ± 19.6; placebo 85.8 ± 24.7 min; p = 0.028) and total sleep time (caffeine 391 ± 97; placebo 464 ± 49 min, p = 0.028). In addition to the changes in sleep parameters you can see in Table 1, two of the six subjects (33%) reported caffeine related anxiety, and mild gastrointestinal upset during exercise - effects that occurred even before they went back to bed. "But caffeine is so good!?" What do you say? "Caffeine is so good"? Yes, it is. I mean, caffeine in fact "so good". 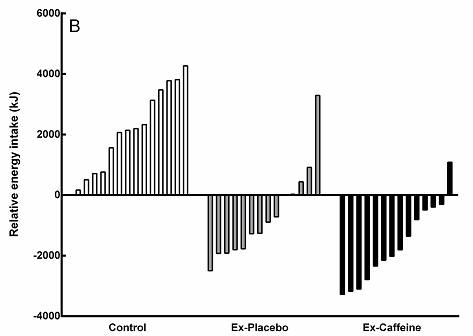 In Miller's study, it lead to improved time trial times during cycling in all subjects (even the anxious and nauseous ones; caffeine 19.7 ± 3.3; placebo 20.5 ± 3.5 min; p = 0.006), while reducing the rates of perceived exertion (caffeine 12.0 ± 0.6; placebo 12.9 ± 0.7; p = 0.004) and heart rate (caffeine 175 ± 6; placebo 167 ± 11 bpm; p = 0.085). Surprising benefits for type II diabetics: In spite of the fact that the contemporary evidence clearly indicates that a regular moderate to high caffeine consumption protects against type II diabetes (-29% risk; Jiang. 2014), even scientists question, whether caffeine is still beneficial, whence you're already diabetic. A recent study from the Midwest State University of Parana does now suggest that at least the small minority of type II diabetics who work out, can benefit from the glucose reducing effects of pre-workout caffeine supplementation. With a 65% reduction and 75mg/dl (p < 0.05), the allegedly high amount of 1.5mg/kg caffeine lead to a highly significant reduction in plasma glucose in the eight diabetic subjects (age 55±10 years) who worked out at only at 40% heart rate (HR) reserve for 40 min at the facilities of the Science Postgraduate Program (daSilva. 2014). This is yet not the only good news scientists have come up with since the last SuppVersity caffeine review. Researchers from the School of Allied Health Sciences at the Griffith University in Australia (Schubert. 2014), for example, report that "combining caffeine with exercise creates a greater acute energy deficit" and could thus provide the foundation to increased weight loss / reduced weight gain in both lean and overweight individuals. 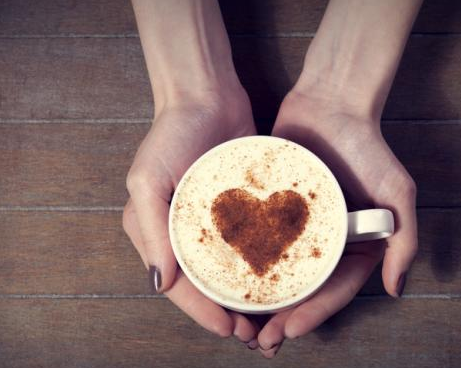 Is caffeine the agent that keeps you lean? The subjects in the study at hand were required to be non-smoking and non-obese (BMI < 30 kg/m²), pre-menopausal (women), between 18 and 45 years of age and not on any medicine known to influence lipid, carbohydrate, or caffeine metabolism (except oral contraceptives). They were not allowed to be dieting and had had to be weight stable in the previous 3 months (± 5 % by self-report), Moreover, they were free of any cardiovascular or metabolic diseases and otherwise healthy. We're not dealing with caffeine naive individuals! 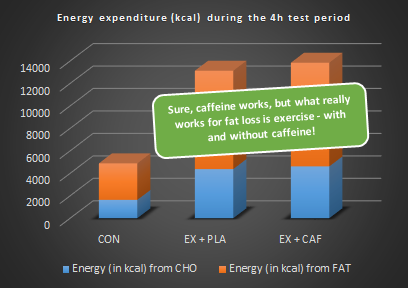 In view of the fact that the central nervous system effects which are in turn highly relevant for the influence of caffeine on energy expenditure and fatty acid oxidation, it's important to point out that the subjects were not caffeine naive. Both, the 6 men and 8 women who participated in the study at hand had a habitual caffeine consumption of 206 ± 194 mg per day. To make sure that the individual dietary preferences of the subjects would not mess up the results, participants were asked to complete a food diary and record all food and drink. Additionally, all participants were also asked to refrain from strenuous exercise the 18 hours before their trial to which they had to come after an overnight fast and without breakfast. When they arrived at the lab, the subjects received 3mg/kg body weight with 250ml of water. Afterwards they had to sit quietly before the resting energy expenditure (REE) was measured continuously for the final 20 min of a 60 minute rest period. After the 60 minutes at rest, the participants then completed 60 min of exercise on a cycle ergometer, at ~65 % power output of VO2max (EX and EX+CAF) or rested/worked quietly (CON). During exercise, mechanical work and power output data were recorded continuously, while gas exchange (VO2, VCO2, RER) was recorded for the first 15 min and then from 25-35 min and 45-55 min. The power output was adjusted as necessary to maintain ~65% of the estimated power output at VO2max. The attained power output from the first exercise trial was duplicated in the second one. At 15 min intervals, participants provided ratings of perceived exertion, leg pain, and pleasure/displeasure (Feeling Scale); heart rate was also recorded at these times. Enjoyment was assessed post-exercise via completion of the Physical Activity Enjoyment Scale (PACES). Aside from the fact that the average US adult probably won't consume more than 200 mg and thus ~40mg less caffeine than the male study participants (average body weight 81kg) of the study at hand with one cup of coffee, Schubert et al. have thus created a pretty realistic scenario the exercise component of which matches the situation of the average pre-workout consumer pretty well. As you can see in Figure 3 the provision of caffeine leads to significant increase in total energy expenditure during and after the workout and a highly significant shift from carbohydrate to fat oxidation. Burning more fatty acids ≠ losing more fat! What you should keep in mind, though, is that the increase in fatty oxidation which amounted to 27.7% when we consider the complete trial will not necessarily translate into an increase in fat loss. Without the concomitant 5.5% increase in total energy expenditure (measured over the whole 240min; including the time before the workout), those 27.7% higher rates of fatty oxidation would be almost worthless - the energy that would have been lost from the glycogen stores of the muscle and liver at higher carbohydrate and lower fatty acid oxidation rates would eventually have to be restored, as well... So, believe it or not: If you lose weight or not depends solely on your effective (!) energy balance, i.e. the difference between the amount of energy you consume and the amount of energy you really expend (which has often little to with the amount of energy a stupid calculator tells you you would expend | learn more about these calculations). If we don't care about weight, but fat loss, however, the increase in fatty oxidation during the workout may matter, yet again. In contrast to the oxidation of fatty acids during the workout, the restoration of muscle and liver glycogen will eventually not necessarily happen in the absence of amino acid and thus possibly (!) muscle breakdown. A fact that leaves the "caffeine doped" athlete at a two-fold advantage: (1) Increased overall energy expenditure and (2) a decreased risk of lean mass loss. Bottom line: So what have we learned today? First, you got to be careful not to mess up your sleep economy by (ab-)using caffeine too close to going to bed. All the beneficial effects on fatty acid oxidation and total energy expenditure, before during and after a workout (see Figures 4 & 6); and even the glucose lowering effects in diabetics are after all hardly worth the paper the studies in which they were reported were printed on, if your sleep quality and thus your glucose tolerance (Gottlieb. 2005), your cognitive function (Hobson. 2002), immune health (Dinges. 1997), endocrine function (Spiegel. 1999) and cancer protection (Blask. 2009) suffer | Comment on Facebook! Blask, David E. "Melatonin, sleep disturbance and cancer risk." Sleep medicine reviews 13.4 (2009): 257-264.
da Silva, Luiz Augusto, et al. "Caffeine modifies blood glucose availability during prolonged low-intensity exercise in individuals with type-2 diabetes." Colombia Médica: CM 45.2 (2014): 72.
sports sciences 30 (2012): 115-120. Dinges, David F., et al. "Sleep deprivation and human immune function." Advances in neuroimmunology 5.2 (1995): 97-110. Gottlieb, Daniel J., et al. "Association of sleep time with diabetes mellitus and impaired glucose tolerance." Archives of internal medicine 165.8 (2005): 863-867. Gibson S, and Shirreffs SM. "Beverage consumption habits '24/7' among British adults: association with total water intake and energy intake." Nutrition journal 12 (2013): 9. Härtter, Sebastian, et al. "Effects of caffeine intake on the pharmacokinetics of melatonin, a probe drug for CYP1A2 activity." British journal of clinical pharmacology 56.6 (2003): 679-682. Hobson, J. Allan, and Edward F. Pace-Schott. "The cognitive neuroscience of sleep: neuronal systems, consciousness and learning." Nature Reviews Neuroscience 3.9 (2002): 679-693. Jiang, Xiubo, Dongfeng Zhang, and Wenjie Jiang. "Coffee and caffeine intake and incidence of type 2 diabetes mellitus: a meta-analysis of prospective studies." European journal of nutrition 53.1 (2014): 25-38. Mitchell DC, Knight CA, Hockenberry J, Teplansky R, Hartman TJ. "Beverage caffeine intakes in the US" Food and chemical toxicology : an international journal published for the British Industrial Biological Research Association 63C (2013): 136-142. Schubert, et al. "Caffeine consumption around an exercise bout: effects on energy expenditure, energy intake, and exercise enjoyment." Articles in PresS. J Appl Physiol (August 14, 2014). doi:10.1152/japplphysiol.00570.2014. Shilo, Lotan, et al. "The effects of coffee consumption on sleep and melatonin secretion." Sleep Medicine 3.3 (2002): 271-273. Spiegel, Karine, Rachel Leproult, and Eve Van Cauter. "Impact of sleep debt on metabolic and endocrine function." The Lancet 354.9188 (1999): 1435-1439. Weinberg, Bennett Alan, and Bonnie K. Bealer. The world of caffeine: the science and culture of the world's most popular drug. Psychology Press, 2001.